Editor’s note: Passport to Cheese is Cheese Market News’ feature series exploring the dairy industries of nations around the world. Each month this series takes an in-depth look at various nations/regions’ dairy industries with coverage of their milk and cheese statistics and key issues affecting them. The nations’ interplay with the United States also is explored. We are pleased to introduce our latest region — the British Isles. MADISON, Wis. — Cheesemaking in the British Isles dates back to the Roman occupation in the first century A.D., according to Jason Hinds, sales director and co-owner of prominent London cheese retailer Neal’s Yard Dairy. The Romans, who had experience in dairying, contributed to the development of local cheeses, particularly those made on farms around the Roman town of Chester, the birthplace of Cheshire cheese. 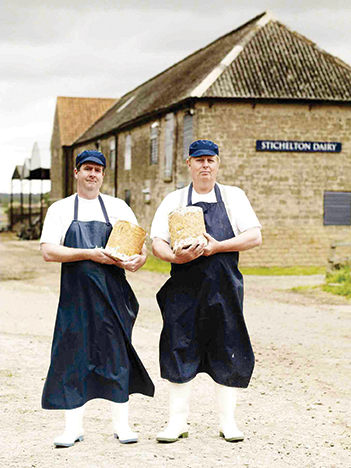 NEW NAME, OLD TRADITIONS — Joe Schneider (left) and Randolph Hodgson (right) founded Stichelton Dairy in northern Nottinghamshire, England, in 2006, aiming to bring back a traditional Stilton made with raw milk. Because they use raw milk, they cannot use the PDO-regulated name “Stilton,” so they chose the name “Stichelton” — a 12th-century form of the name of the village Stilton. He adds that cheeses generally have been made on the western side of the British Isles where most of the rainfall comes, and they bear names of the villages or counties where they were made, such as Cheshire, Lancashire, Gloucester and Cheddar. Starting in the late 1800s, the introduction of large-scale dairies and factory cheese production, along with cheaper competition from abroad, resulted in a reduction of farmhouse cheesemakers — those using milk from their own herds for small-scale cheesemaking. Hinds notes that numbers continued to decline as many of the cheesemakers went to war, and rationing continued in the years following World War II. Later on, the advent of supermarkets, regulations and increasing mass production further reduced the number of small and farmhouse cheese producers. The Milk Marketing Board was established in 1933 to manage and market British milk and cheese, providing more stability for farmers and cheesemakers. The Milk Marketing Board also began manufacturing much of the cheese, continuing to produce and market cheese and other dairy products until it was abolished in 1994. Today there are a number of large cooperatives and dairy brands that process and market milk for dairy farmers in England, Scotland and Ireland. Dairy Crest, which started in the 1960s as a butter and cheese brand of the Milk Marketing Board, now is a commercially-focused business with four main consumer brands and 400 British dairy farmer suppliers. The company boasts that its Cathedral City Cheddar, made in its creamery in Cornwall, England, is the United Kingdom’s leading cheese brand. First Milk, based in Scotland, is a major dairy company owned by British family farms. Its product line includes Cheddar and regional cheeses, dairy ingredients, fresh milk and sports nutrition products. Its creameries on the Mull of Kintyre and Isle of Arran in Scotland, the English Lake District and the southwest tip of Wales produce a range of Cheddars, Red Leicester and Double Gloucester. Milk producers formed United Dairy Farmers after abolition of Northern Ireland’s Milk Marketing Board in 1995 to provide a cooperative to process and market their farmers’ milk. Dale Farm, which the cooperative acquired in 2001, processes and markets a wide range of dairy products for domestic and international markets at its six plants throughout Northern Ireland, England and Scotland. Other major dairy processors in the region include Arla Foods UK and Müller Wiseman Dairies in the United Kingdom, and Glanbia, Kerry and Ornua in Ireland. 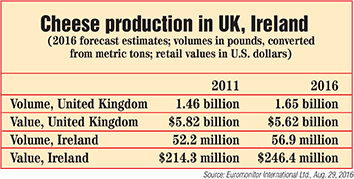 In addition to its large processors, the British Isles have experienced a Renaissance of sorts in farmhouse and specialty cheese over the past 20-30 years, led by increased interest by consumers as well as cheesemakers. Jaap de Jonge, owner of Jongia UK, which provides equipment for small-scale cheesemakers, says he has seen many people leaving various professions to start up small cheesemaking businesses. Many of these do cheesemaking as a “hobby job,” de Jonge says, though some have grown and become more established. Roddy Wilde, business development manager for the Scottish Dairy Brand, says he has seen Scottish cheesemakers getting quite inventive. Hinds says many of the newer cheesemakers are steering more toward varieties that are not traditional to the British Isles, using goat’s or sheep’s milk and making continental-style cheeses, emulating recipes from other parts of Europe. “They’re expanding the British range to be more comprehensive, covering different varieties that exist in the cheese lexicon that previously weren’t produced in the UK 30 years ago, whether it’s a Brie, Camembert, washed-rind, goat’s or sheep’s milk cheese,” Hinds says. Hinds says he foresees continued increases both in farmhouse cheesemakers and the number of varieties available. The British Isles are home to 17 protected designation of origin (PDO) and protected geographical indication (PGI) cheeses registered by the European Commission. The most well-known of these is Stilton, while others include Single Gloucester, Yorkshire Wensleydale and Orkney Scottish Island Cheddar. Stilton has been made for generations in the three English counties of Leicestershire, Derbyshire and Nottinghamshire. It is available in a white version and the more famous Blue-veined version, and the cheese must be made with pasteurized milk, according to the PDO product specifications, which were enshrined in legislation in 1996. Schneider adds that Blue Stilton is very different from French Blue cheese varieties in its shape and how it’s salted. Today, there are six cheesemakers in Derbyshire, Nottinghamshire and Leicestershire counties licensed to produce PDO Blue Stilton, according to the Stilton Cheesemakers’ Association. Stichelton Dairy in 2006 became the first farmhouse cheesemaker since the 1930s to produce a Stilton-style cheese, and the first since the late 1980s to do so using raw milk. However, since PDO Stilton is required to use pasteurized milk, the revived raw milk version could not use the name “Stilton.” Instead, Schneider and co-founder Randolph Hodgson chose the name “Stichelton,” a 12th-century form used for the village of Stilton. Schneider, who has been fighting to allow raw milk to be used under the PDO, says even without the Stilton name, Stichelton has gained the support of many cheese shops and customers who appreciate the traditional cheesemaking techniques. “Anyone at that end of the cheese world, selling regional and farmhouse cheeses, will recognize it’s the king of English cheeses and fantastically unique,” he says. While Stichelton Dairy limits its output to preserve the quality and character of its cheese, it does make enough to meet some demand overseas in markets including the United States, New Zealand, Italy, Spain and other European countries, Schneider says. Other cheeses and dairy products from the British Isles also are finding success overseas, particularly as recent initiatives have expanded global presence and recognition. The Irish dairy cooperative Ornua, the country’s largest exporter of Irish dairy products, earlier this year opened a new cheese manufacturing facility in Saudi Arabia and also acquired Shanghai-based cheese and dairy manufacturer Ambrosia Dairy. Over the last couple years, Ornua also has invested in acquisitions and significant infrastructure development in Africa, China, Germany, Ireland, Spain, the UK and the United States. Ornua says its Kerrygold butter was the No. 3 branded butter in U.S. sales volume last year and the No. 1 butter brand in Germany. The cooperative reports its cheeses also are performing strongly in U.S. and overseas markets. Last year, the Scottish government unveiled a new Scottish Dairy Brand and logo to help boost the profile of Scottish dairy products overseas. The brand made its market debut earlier this year in the United States and will target Canada later this year, as well as Western European markets, the Middle East and Asia in the future. Wilde says there are a lot of small producers making a variety of different cheeses in different regions in Scotland, and the Scottish Dairy Brand is composed of the best and most export-capable of these products. Among those highlighted during June’s Summer Fancy Food Show in New York were Connage Dunlop — a traditional clothbound cheese made by Connage Highland Dairy from a recipe dating back to 1668; Orkney Smoked Red, a 14-month double-smoked Cheddar from the Orkney Islands, where The Island Smokery has been producing this cheese for the past 10 years; and First Milk’s Mull of Kintyre brand Cheddar from the historic Campbeltown Creamery, which has been producing cheese since 1923 on Scotland’s Kintyre Peninsula. These cheeses will be distributed in the United States by Atalanta.